Happy Mother's Day! My two Mothers are forefront in my mind. I am truly grateful for my amazing Mother that gave birth to my physical being, cared for me, raised me, nurtured me, taught me...and so much more. I know I was not the easiest daughter to raise (I was very rebellious - imagine that?!?! ), but my mother's patient support gave me the strength to follow my inner world and my dreams. When most other voices suggested I just put my head down and follow the status quo, my Mother lifted my face to the sky and walked with me to the rainbow's end! I love you Momma! My thoughts turn to the Mother we all share...this miraculously complex planet called Earth. Without this intricate ecosystem, sustaining all lifeforms as we know them, we would not experience Life. The air we breath, the water we drink, the food that nourishes our cells....is all provided by this huge whirling, living mass in a mostly dark, empty solar system. We cannot separate ourselves from her and the resources she provides without question or judgment. In honor of our shared Mother, I will donate 1% of all my GreenClub Memberships created this week to the Mother Earth preserving nonprofit of your choice. Email me or post your nonprofit selection on this blog entry and the donation will be made in your name! Thank you, Mothers, for giving me life! I am much more excited about the One or Ten Release than I anticipated. Selecting the songs was quite difficult - thank you for sending me your favorites to assist me! Today marks the Beta Launch of my FanClub AND TuneTrack - our new record label's music website for the best musicians I know. John Jones and Jayson Haws will both be launching new albums in the next several weeks. You will be blown away by each record - I am so honored to work with these guys. All of us at ArtisTech agree we haven't heard albums this good in a very long time. Thank you, everyone, for your tremendous support. I sit here with tears in my eyes, thinking of my friends, family and colleagues that bless my life. Thanks for joining my GreenClub! A portion of the price goes to each artist that participated on the album. Oh, and let me know what you think of One or Ten! Emily's FanClub launches on 4/20! Members receive her upcoming new release, One or Ten, a compilation of Emily's favorite ten songs she's ever recorded. For just $4.20 on 4/20, Emily's FanClub Members will also receive exclusive access to recordings of rehearsals and performances as well as Emily's For Member's Only private blog. Submit three of your favorite Emily Richards songs to win a free 4.20 FanClub Membership*! Correctly guess all ten tracks on "One or Ten" and win Emily's musical catalog (over $100 value). Send your picks to Emily at Twitter or Facebook. Check out some of the remixes of my stuff HERE! 'Bewildered' is the third recording from Emily's upcoming acoustic live album available to fan club members only at www.tunetrack.net. View the other videos at www.youtube.com/artistechmedia! I have narrowed my album, Open, down to 18 songs and I think five or four more need to be cut. This album has been five years in the making compared to one year or less for my other ten. The year-long tour of 2004 and nearly four years as President of MP3tunes took me away from recording, but not from writing, so I am having a bit of difficulty deciding which songs to exclude. At TuneTrack.net, I'll be posting preproduction versions of the songs for members of my Fan Club so you can help me determine which songs, and how many in total, will make it on the actual album. I will also be putting up certain source tracks for remix and creative commons license at ccmixter.org. What of the Luck of Love? The Love of Venus (shining high and bright in the early evening sky) hearkens to the Buddha quote above...being well trained and using well spoken words. The Love of Cupid can be likened to dumb luck and is fleeting. 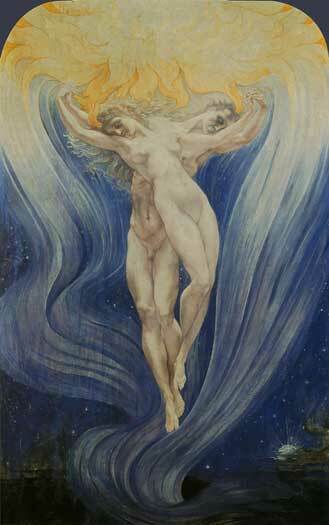 The Love of Souls, the painting below by Jean Delville, is one of my favorites. Clicking it will launch a special Valentine's Song for you. I've had the most amazing week - certainly one of the most magical of the past decade. Monday, I arrived in San Francisco and spent the evening with my NBB family, Joe and Lisa Jobe, Jason and Jason Hoar. Tuesday, we opened for Melissa Etheridge at the General Session of the Biodiesel Conference and she impressed me to no end. Her life experiences have awakened her...her voice, her music, her message....all powerful. That afternoon, Jason and I met Chuck Leavell (Rolling Stones) and ended up rehearsing and later performing You Can't Always Get What You Want together. Jason and I closed out the night with a powerful concert to a wonderful crowd and dear friends. Wednesday, we flew to Salt Lake City and performed for the Investor's Choice Conference. I reconnected with PwC and other colleagues I haven't seen in many years. Today, we met with a variety of investors for our new record label, ArtisTech Media. I am blessed with abundance in a time of difficulty. Tonight, a small group of Wayne Brown Institute Folks gathered for dinner and later drinks. What a bright and genuine group of people. Tomorrow we ski Deer Valley and will later celebrate my birthday with family and childhood friends. In times of despair, have hope. Love abounds! Emily Richards is not only a talented musician, she is also a yogini. Emily has practiced yoga, Kundalini, Vinyasa, Hatha, and Bikram since 1998. Emily teaches private yoga classes for individual students only. Emily has just released "I Heard The Bells On Christmas Day" as a holiday gift to her fans. Emily has set a new tone to this traditional carol based on Henry Wadsworth Longfellow's civil war poem. "I Heard The Bells" is a free, featured song at Tunetrack and available for download HERE. AMAZON RHAPSODY ITUNES Peace on earth, goodwill to all! Hear Emily's set for tonight, before the show! Click HERE to listen to Emily's rehearsal recorded way too early this morning. The login will only be good for the next 24 hours. Emily Richards left the glitz and artistry of Los Angeles four years ago to become the President of MP3tunes, a Michael Robertson company, based in San Diego. In late September, Emily bid MP3tunes a fond farewell to return to her music, patiently incubating in the wings. Emily will make a special guest appearance Monday night, December 15, at John Jones's Birthday Tribute. This will be Emily's first LA appearance since she left the City of Angels four years ago. Emily is currently in the studio, recording her 11th album, "Open", working with producers/musicians John Jones , Brad Stanfield, Sean Halley, Dave Uosikkinen, DJ Quenique, and Jason Brock. Stop by Life on Wilshire this Monday, December 15 at 9.30 pm to experience Emily's musical reunion with John, Sean, Jason and others. Emily Richards, Alex Goodwin, Derek Ford and Kirsten Swartz-Morton announce their newest venture ArtisTech Media, LLC - a specialized technology company focused on music and media from an artist's point of view. Tunetrack is the flagship project of ArtisTech. Tunetrack provides musicians and music lovers access to bands 'behind the scenes' through a tiered network. Get access to yesterday's band rehearsal, last night's concert or today's new composition at www.Tunetrack.net. Tunetrack teams with DoubleTwist Ventures to give musicians an easy way to share their creations with their fans via Facebook, YouTube, Flickr and a growing list of mobile devices. Via Tunetrack's website and technology, Emily be sharing the play by play process of recording her new album, 'Open'. Limited beta-access will be granted to dedicated listeners in the upcoming weeks. Visit www.artistechmedia.com, www.tunetrack.net and www.emilyrichards.com to stay informed. Come see Emily and 2012AM at EarthDance on Saturday Sept 13 from 1 to 2pm in Balboa Park! Featuring DJ Quenique, Jason Brock, Mark Wooton, Alex Goodwin and Derek Ford. Emily and 2012AM perform Sunday June 29 at the Evolution Lounge, at 6p. Visit www.evolutionlounge.net for more information. I am the President of MP3tunes -- home of the online Music Locker. The concept of digital ownership is very important to me as a music fan, a musician, and now as a business owner in the digital age. EMI got my hopes up for a while -- making progressive moves like selling their catalog in MP3 with iTunes Plus tracks. And there was a time when I thought we were going to actually arrive at a business deal with them that would have been great for artists, labels and internet companies like ours. I am naive. I believe people will see beyond this American short-sightedness that has our economy in a tailspin, and make intelligent decisions. It would be intelligent for the record companies to embrace the digital age -- and innovate instead of litigate! It seems putting up cheap tollgates along the Mexican/American border would be a much better use of resources than building an expensive fence that can be dug under, climbed over or circumvented in some other way. If I can't store my music collection (that I've purchased numerous times -- with each format shift!) on some hard drives in a server room owned and operated by someone else, with the same protection I have for my financial accounts, well, Houston, we have a problem. "Let me start by saying that as the CEO of MP3tunes I appreciate all your support over the last few years. Our customer's suggestions and patience have helped us build the Locker system we have today. We just launched AutoSync -- making the management of your music collection easier than ever. As you may be aware, the major record label EMI has sued MP3tunes, claiming our service is illegal. You can read about the case here. Much is at stake -- if you don't have the right to store your own music online then you won't have the right to store ebooks, videos and other digital products as well. The notion of ownership in the 21st century will evaporate. The idea of ownership is important to me and I want to make sure I have that right and my kids do too. 2) If you have a chance to talk publicly about our cause on your blog, with friends, reporters or even EMI personnel please do so. MP3tunes is working hard to design a secure personal music service. We don't promote sharing of music in any manner. We want people to legally acquire their music. But once they do, we think it's important that you be able to use it how you want for your personal use. The AmazonMP3 store says: "You may copy, store, transfer and burn the Digital Content only for your personal, non-commercial, entertainment use." and this is what MP3tunes allows you to do. You have my commitment that I'll continually battle for your right to store your music online and listen to it anywhere on any device. I hope you'll consider helping MP3tunes in our battle. Thanks. So I've decided to give away all of the songs from my latest 7 albums on this website for FREE for the next 2 weeks and hope they all end up on Sideload.com! Enjoy my creations -- mash them up, share them with friends and if you decide, buy a CD from CDBaby or a download from iTunes -- or make a donation to my nonprofit -- awakecommunity.com. Click the pix to listen! I've been greatly discouraged by the state of the nation, particularly the corruption of our government that is contributing to our economic decline and unwarranted world policing. Ron Paul states he will bring our troops home. This is by far the best way to protect our country. The illusion of 'staying to finish the job' is just brainwashing propaganda. Sure, keep killing and maiming people and blowing up buildings and roads - and that will somehow bring peace? Hello!?! Are we really that illogical? Ron Paul believes in upholding the Constitution. Novel idea. Our Founding Fathers took great care to create Checks and Balances for times like these -- when ultimate power corrupts ultimately. Of course, when the Executive Branch usurps and overturns key constitutional checks and balances, well, goodbye democracy (have we really ever said hello?). Ron Paul is the only candidate letting the people know we are in trouble. Goodbye IRS! As a CPA, I realize many of my colleagues will need to reinvent their careers should this miracle occur. I can only pray we get this opportunity! If we actually stop giving a third of all our wages (did you know this is actually unconstitutional?) to the big centralized federal government, the politicians can't subsidize wars, oil companies, and mono-cropping. Don't let them fool you into thinking the government should take care of you (remember Hurricane Katrina?) -- trust me, we're much better off keeping our taxpayer money and letting local nonprofits and honest people help each other with all of the issues we face. During the San Diego fires, we took care of each other, and quite well at that. I don't agree with all of Ron Paul's stances....but it is imperative we restore the Constitution, bring our troops home from around the world and stop funding the corrupt politicians. If we can fix these key items, then perhaps we can begin to worry about the issues they are distracting everyone with in the media. I am proudly supporting Ron Paul for President and hope you will consider doing the same. Visit www.ronpaul2008.com. EMI is suing my company, MP3tunes. Some things never change. My years as a recording artist in L.A. taught me much about the music biz - the men in suits constantly pushing for the mass-marketable while you hold desperately to your art. "Show more skin...stop being political...write a love song with a pop hook...lose weight." These nice fellas dangle money, contracts and cheering crowds kindly in your face. They pay you mechanical and performance royalties to demonstrate your 'need' for their power and infrastructure. And the term 'sell-out' lurks as a warning among all true artists. MP3.com came along and revolutionized music via technology (thank you my beloved geeks!). Musicians and music fans didn't need major labels for distribution, record sales, promotion or tours. The labels panicked and sued MP3.com into oblivion. Michael Robertson gathered his remaining assets and regrouped. Musicians lost their new home. The record industry blundered and diluted the creation of the digital music age by shutting down the original MP3.com and crippling the digital music experience with major-label marketing fluff and proprietary file formats with DRM. Here we are seven years later -- an entire octave on the digital musical scale has been played and we're back to the root note (the 'Do'). Will the major labels evolve or just recur in their same mistakes? CD sales have fallen drastically. iTunes and other 'i' products leave us hanging in a proprietary web. MySpace is a technically weak and inferior place for rising musicians to develop and market themselves. Major labels sell bubblegum singles, Emo and teenbeat music that attracts fleeting fans -- that only push the next quarter's earnings. And young folks think music should all be free. Where now oh mighty record labels? Shall we cower to you with your threats and monetary muscle while your productivity and profitability plummet? Do you still believe your 'business' is more valuable than the artists' backs upon whom you built your business? Will you now perpetuate your thievery and steal from the techies too? I do believe there is a seed of goodness in all people. I saw it in the faces of the 'men in suits' that paid our company a visit last week. No one wants to give up power, money or control. But could you give it up to save your own business (without the need to extort, steal and bully others)? Ayn Rand wrote, "Money is not the tool of the moochers, who claim your product by tears, or of the looters, who take it from you by force. Money is made possible only by men who produce." I challenge the record labels to return to producing something valuable, working in true partnership with others -- then they just might find themselves honestly successful once more. Click the pix to hear the single 'Biodiesel Willie' (premiered on Bill Mack's XM Radio Show at the NBB Conference). See video from the concert performed by Emily & 2012AM here! Visit Emily's MySpace page and leave an artistic message for Peace. Select 'Free Demo' to listen. Visit MP3tunes to get your own free music locker! Emily performed for the U.S. Congressional Stop DUI Caucus, Arts Caucus & Meth Caucus inside the Cannon Office Building...an amazing event!